Bosch power tool attachments help you create complete tool systems. This vacuum hose adapter is designed to use with the most common size hose sizes. The EX810 is a Clamp meter which features built-in IR thermometer with laser pointer for non-contact surface measurements from -58 to 518 degree Fahrenheit (-50 to 270 degree Celsius). Clamp measures AC current up to 1000 Amp with a maximum resolution of 0.1 Amp. The 1.7 in. jaw fits around conductors up to 750MCM. Peak hold captures motor inrush currents and other surges. Data hold and auto power off. Other functions include AC/DC voltage, resistance, capacitance and frequency. Complete with test leads, 9 Volt battery and case. Vacuum Hose Adapter Bosch power tool attachments help you create complete tool systems. This vacuum hose adapter is designed to use with the most common size hose sizes. 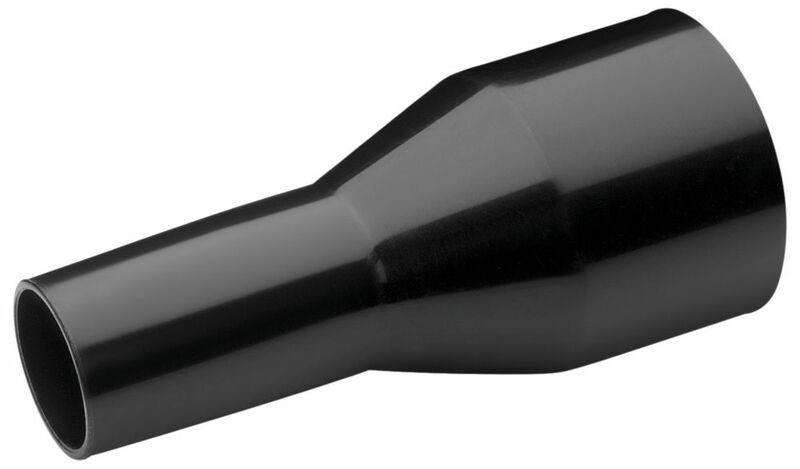 Vacuum Hose Adapter is rated 4.3 out of 5 by 3. Rated 3 out of 5 by RADMOM from WELL, I AM SURE THAT THIS ADAPTOR FITS SOMETHING, AND ALTHOUGH IT IS THE ONE SHOWN WITH THE VACUU... WELL, I AM SURE THAT THIS ADAPTOR FITS SOMETHING, AND ALTHOUGH IT IS THE ONE SHOWN WITH THE VACUUM, IT DOESN'T FIT THE END OF THE HOSE AND THEREFORE, OTHER TOOLS LIKE THE CREVICE TOOL, CANNOT BE ATTACHED TO THE HOSE. Rated 5 out of 5 by Marrsb from Fits Dewalt miter saw This adapter worked perfectly for dust collection from my Dewalt miter saw. I paired it with an autoswitch from Rockler so my vacuum automatically turns on when the saw is in use and continues to run seven seconds after the tool powers off. Nice!